Day three saw us set of from Pozieres again in rather murky conditions, this time heading off towards High Wood. After leaving Pozieres we soon hit 2nd Canadian and Sunken Road Cemeteries. Despite being in the heart of the 1916 battlefields, I think these two cemeteries are seldom visited as access is by a rough dirt track or across the fields.They are both 'battlefield' cemeteries i.e. cemeteries started by units during the battle and not concentrated to larger cemeteries after the war. In a small nearby copse are a number of pits, almost certainly dugouts or gun pits for howitzers and were probably used to support the Canadians during their attacks in the Courcelette area. Above: First three images are of Sunken Road Cemetery (second image in b&w). In the first image what are almost certainly howitzer gun pits can be found in the small copse in the background. In the third image 2nd Canadian Cemetery can be seen in the background. Bottom image is of 2nd Canadian Cemetery. Continuing on, we crossed the Bazentin Ridge, with High Wood looming up in the distance. We cut down to Thistle Dump then up to Caterpillar Valley Cemetery. The images below which show High Wood illustrate how it dominates the area and why it was a key position in the German second line. Above: Top image shows High Wood as seen from the Bazentin Ridge. Second image shows Thistle Dump Cemetery and High Wood in the background. Bottom image shows Caterpillar Valley Cemetery. Heading around the back of High Wood we located the Starfish, on the Starfish Line among other trenches.This was part of the German defences dug when High Wood was threatened. 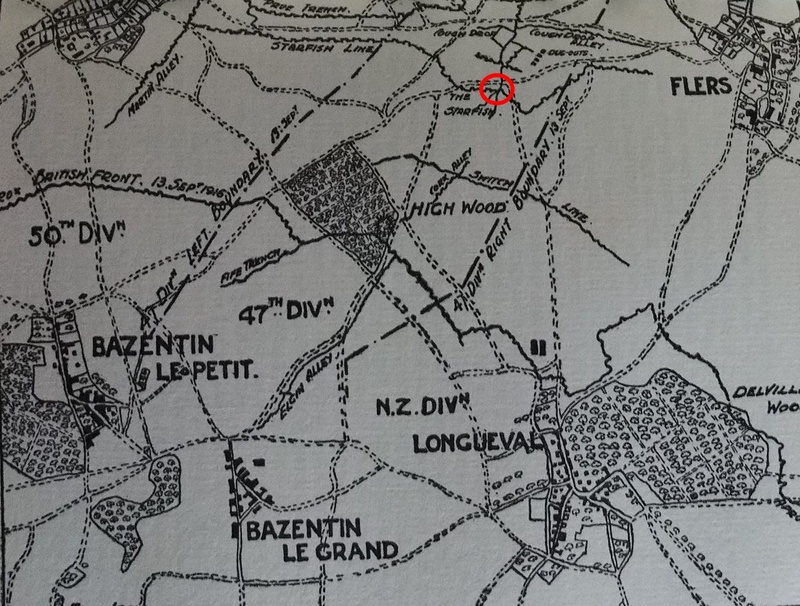 The Martinpuich - High Wood - Flers area finally fell into Allied hands on 15th Sept 1916. Top: Map showing the trenches in the High Wood area, the Starfish highlighted. Bottom: View from the Starfish looking towards Flers. Heading back we stopped off at the London Cemetery in front of High Wood, arriving back at Pozieres for some more beers and omelette and chips! Above: Top image shows High Wood as we headed round, looking rather sinister in the light. Bazentin Wood can be seen in the background. Middle two images show London Cemetery. Bottom image shows High Wood and London Cemetery in front, as we headed back up the Bazentin Ridge in the fading light.